A ten-year-old tabby cat named Oscar has become popular due to his uncanny ability to comfort patients in their dying days at Steere House Nursing and Rehabilitation Center in Rhode Islands. According to doctors at the healthcare facility, Oscar has predicted the deaths of more than hundred people. Oscar gives comfort to the dying. Is he a cat angel to each of them? Oscar is such a precious kitty whose intuition has baffled scientists and doctors. Maybe he is a psychic that is tasked to help dying people and to bring comfort to them during their last hours? Oscars supernatural ability was revealed by Dr. David Dosa, an assistant professor at Brown University. Dr. Dosa wrote an article in the New England Journal of Medicine in 2007 that explored Oscars rare gift. A book titled “Making Rounds with Oscar: The extraordinary gift of an ordinary cat” was published by Dosa who shared his experiences with Oscar. The “miracle cat” spends his time pacing from room to room and cuddles up the patients who are in their final dying days. Dr. Dosa believes that a certain scent of “death” attracts Oscar to end of life patients. Staff at the facility sees the presence of Oscar as an absolute sign of impending death. This enables them to adequate the relatives of the dying patients. Cats are popular for possessing nine lives due to their ability to recover when faced with a death situation. They are known for assisting and feeding each other. It has been observed that cats can smell the death of their fellow cats. They provide assistance to those cats that dying, to lick or keep the other warm. Oscars behavior is his way of offering to terminally-ill patients what he would do other members of its pride. This might sound morbid for non-believers, but Oscars action is a kind and supportive gesture! In 2013, Oscar had a serious allergic reaction and was treated at intensive care unit. He died for several seconds but recovered with the help vets. He became patient for a few months at the nursing home, regained his health, and resumed his role as Doctor Cat! 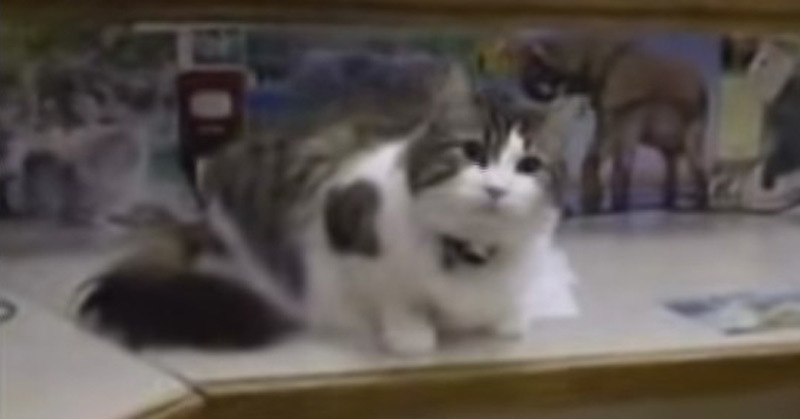 The video is about Hiroshi, a Japanese tabby cat who is getting cozy and cuddly with his owner. It’s bonding time for Hiroshi and his owner who finds the cat so cute that he cannot be angry with him. According to Hiroshi’s owner, the cat loves exploring the house and doing all kinds of cute things. 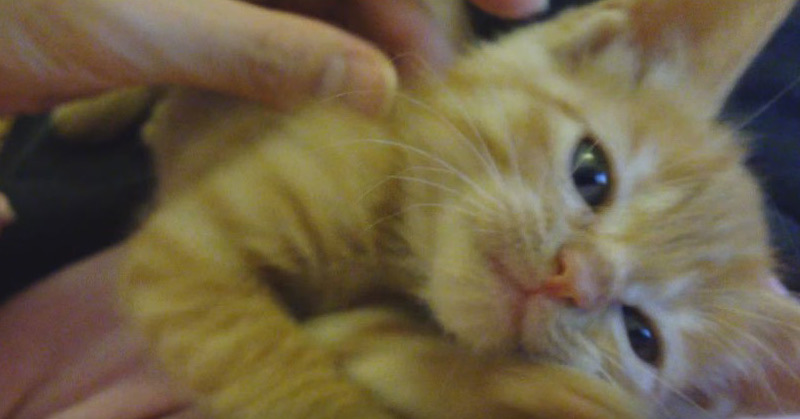 In the video, Hiroshi attempts to doze off as he cuddles with his owner. The purring machine is just being a sweetheart to his owner before he journeys to the land of dreams where cat toys are abound and where he can eat anything that fancies him TWICE! Why do some cats prefer to sleep with their owners? There are several reasons to this behavior. Cats want to experience warmth from their owners and to feel comfortable before they hit the sack. Cats are known for sensing the hormonal scents which also make them at ease with their owners. There is no available scientific paper to prove anything to that behavior. But cats like to sleep with their owners for warmth, love, affection, security, and companionship. Cats feel protected whenever they are near their human companions. In the eyes of cats, their owners are their Supermen, Batmen, Wonderwomen, and Ironmen! The warmth element is seen mostly in older cats. Cats show their love by sleeping with their owners. They are at their most vulnerable during sleep so choosing to sleep with the owner shows their trust to them. The social behavior of cat enables them to bond with their owners. This allows them to bond with each other. Cats and their owners do not spend the whole day together. Bedtime is one opportunity for them to communicate, sort of. Bonding is an emotional aspect of having a pet such as cat. Sleeping with humans is closely associated with emotional safety. 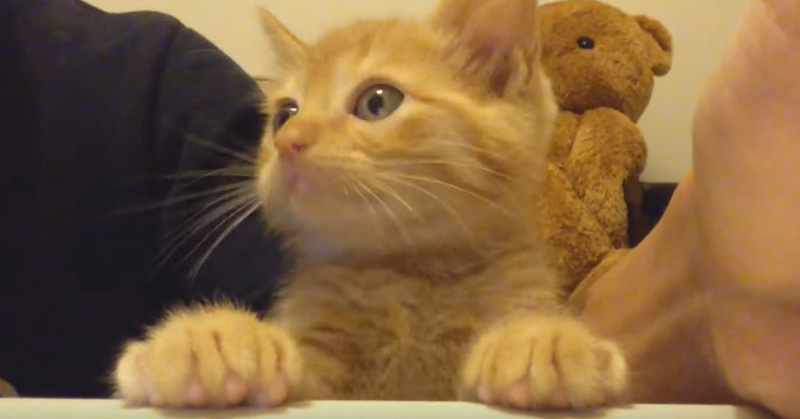 This video is about Hiroshi, a baby Ginger kitten who tries to get some of his owner’s food. Due to her height, Hiroshi is having a hard time reaching the table. Poor cat, he probably wants to partake on what is available on the table! The behavior shown by Hiroshi is tolerable at first but it can result to food aggression if his owner will not train him the do’s and don’ts of feeding time. Preparing dinner on the table can be challenging when your kitten is curious to poke into what is being served for dinner or lunch. So how do you keep your cats away from your food? What can you do to train your kittens that the food is yours and not theirs? Compared to dogs, cats do not have the same ideas of discipline as their canine friends. But your cats can be trained on how to stop them from stealing food from the table. You have to overcome this behavior earlier to prevent your cat from developing a longstanding habit. It is important not to reward your cat’s begging for human food. Allowing your cat at least one bite can result to more begging. If your cat insists for food and reach for the table, do not shove them off or you might harm him. Keeping the food secure is one way to discourage your cats from sneaking on it. Cats are intelligent, so they might figure it out how to open the cupboard doors or remove food covers on the table. You need to provide your cats with enough meal. Though feeding them twice a day is enough, there are cats that become hungry during the day. Three meals per day is advisable. If you are away from the house during daytime, providing three meals can be done by serving the first meal before you leave and giving the second and third meals as you come home and before you go to sleep, respectively. Refrain yourself from punishing your cats when they steal food. Their behavior needs to be stopped and not to be punished. How Adorable Is This Russian Blue Cat Luna? Every Day. Every. Darn. Day.